Mack #5174 - Yankee Golden Retriever Rescue, Inc.
Mack was 11 when his family could no longer keep him. Mack had a history of chronic ear problems. 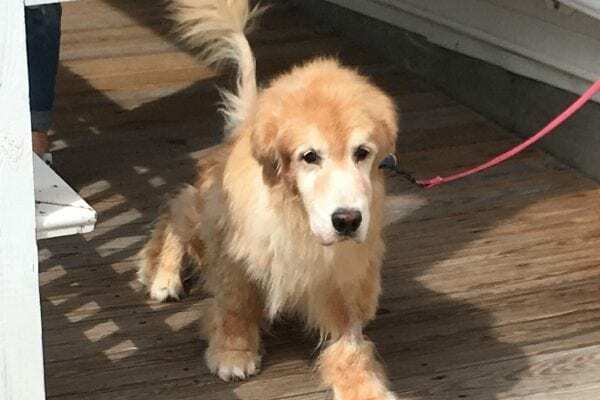 He was taken to the vet for the most recent complication, an ear hematoma, and his family realized that they would not be able to continue to give Mack the medical treatment he needed. Mack’s family had young children and a baby due any day. Finances were already strained due to a recent job loss, necessitating the difficult decision to find Mack a new home. Mack went straight to one of YGRR’s veterinarians. His ears were examined and treated. He was also given a complete geriatric workup, including bloodwork and x-rays, was neutered, and had his teeth cleaned. In addition to his ear infection, Mack was treated for a urinary tract infection, as well. Then Mack came back to Riverview to settle in. Mack was a sweet, affectionate boy. He truly loved all creatures, great and small. In fact, his original family said that one day they thought Mack was lying in his crate licking his paws. Instead, they discovered that there was a mouse in the crate, and Mack was lovingly grooming the mouse! The mouse was rescued from Mack’s attentions and was released – wet, but unharmed! Mack enjoyed many different activities during his stay at Riverview. 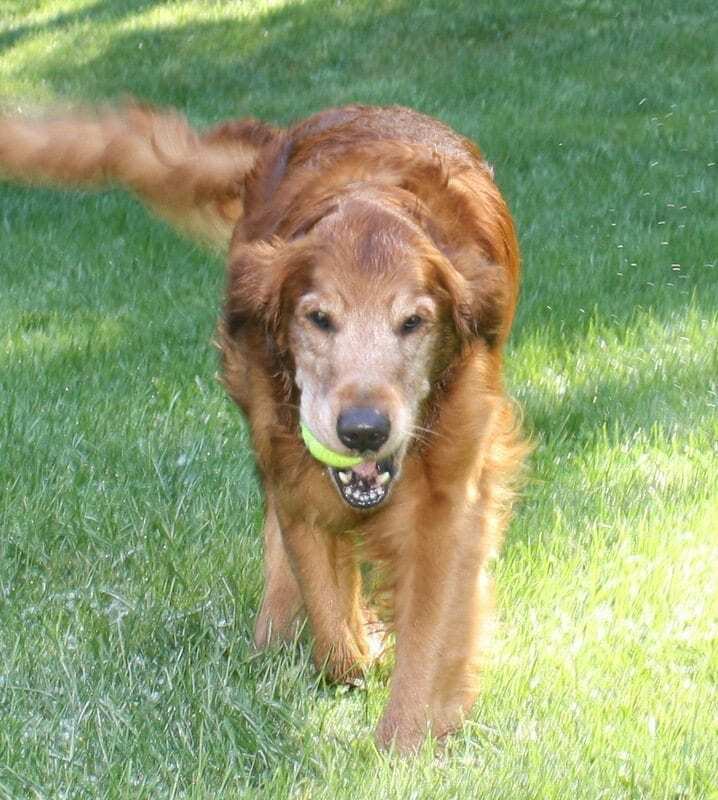 He loved to walk in the woods or play ball in the yards. He was great with the other dogs. He could often be seen rolling blissfully in the grass, as well. His favorite thing was to hang out with staff in the adoption room and offices, though it could be challenging to get any work done because Mack loved human attention and would nudge your hand if he was not getting enough of it! Mack met many new fans at our Annual Auction where he loved being the center of attention! Mack’s health issues gradually were resolved and it was time to place this loving boy into a forever home. Mack is now living life to the fullest and getting all the attention he deserves in his loving adoptive home. In addition to his humans who dote on him, Mack loves his canine sisters Ginger Belle, YGRR #5058, and Annie the Bulldog! Mack also has other friends, both human and canine. He loves his walks and he loves to swim. He came back from one outing and promptly stole a sandwich off the counter, but his adopters said, “What’s a swim without a picnic?” Mack also has decided that in bed with his humans is where he will spend the night, thank you! Mack and his adoptive family could not be happier to have each other! Mack thanks you for your continued support. Your generosity is important so that we can continue to take Goldens of a wide range of ages and with various medical conditions. All seniors get the complete care that Mack received to ensure that they are starting off in their adoptive homes feeling their best. You make this possible! Mack and all the Rescue Goldens send big wags and kisses your way!